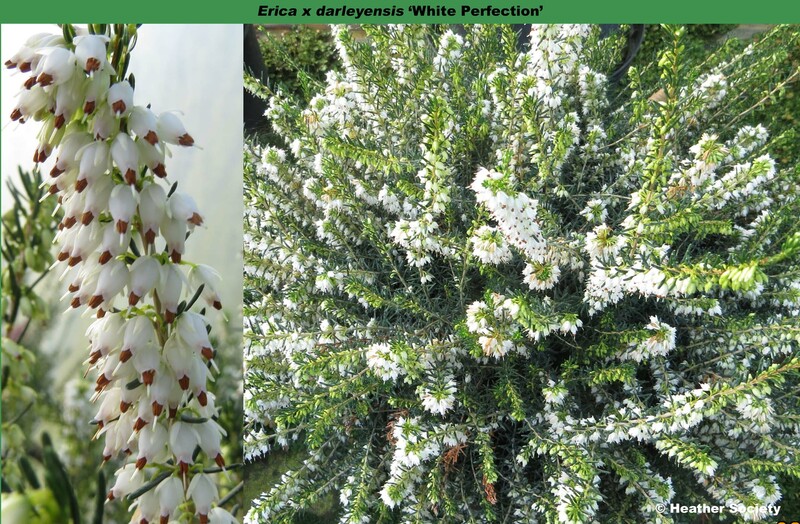 Pure white flowers; XII–IV; bright green foliage, the young shoots tipped yellow in spring; erect; height 31–45cm; spread 61–75cm. Calyx lobes almost as long as corolla; sepals c. 4mm, corolla c. 4.5mm; bract & bracteoles above midpoint of peduncle; anthers tan, partly included [spec. in herb P G Turpin, grown at Cottswood 22 January 1981]. Outstanding – best of the white Darley Dale heaths. Sport on 'Silberschmelze'; found by H. Knol (Gorssel, Netherlands); introduced by Knol about 1972. Listed by Heinz Schlangen (Westermoorstr. 33, 26683 Saterland/Scharrel, Germany) as "White Perfektion".